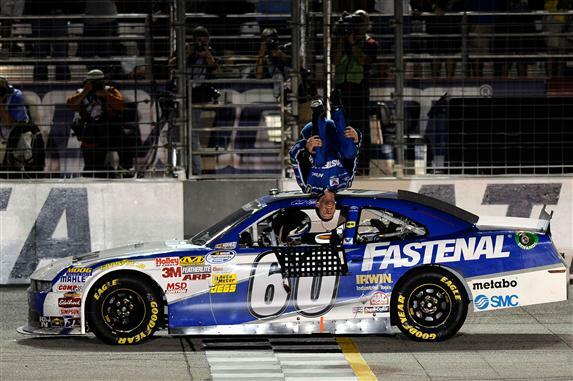 HAMPTON, Ga.—Polesitter Carl Edwards held off Kyle Busch during a frantic final 10 laps of Saturday night’s Great Clips 300 at Atlanta Motor Speedway and, despite a pit-road penalty early in the race, notched his sixth Nationwide Series victory of the year and the 35th of his career. Busch, who chased Edwards to the checkered flag after passing Ricky Stenhouse Jr. for second place on Lap 186 of 195, was the runner-up, .697 seconds behind Edwards. Stenhouse, the series points leader, came home third, followed by Kevin Harvick and Kasey Kahne. After regaining the lead from Harvick following a Lap 177 restart, Edwards stayed there and held a comfortable advantage until Busch cleared Stenhouse for second. Edwards’ crew was fastest during pit stops under caution on Lap 165, and he led the field to a restart on Lap 169. Harvick, however, grabbed the top spot before the lap was over and stayed there until contact from Justin Allgaier sent Turner Motorsports teammate Reed Sorenson’s Chevrolet into the Ford of Trevor Bayne in Turn 2. “I will tell you one thing: I’ll find him after the race, and it’ll be between me and him—I promise you,” said Sorenson, who took a huge hit in the Nationwide standings. Allgaier, who finished sixth, said after the race he wanted to find Sorenson, too—to apologize. Sorenson finished 32nd and now trails Stenhouse by 40 points. Edwards led from the outset, pacing the first 41 laps before Eric McClure smacked the Turn 2 wall to cause the first caution. During pit stops on Lap 43, Edwards dragged an air gun beyond the boundary of his stall and had to return to pit road to serve a penalty. Busch led the field to a restart on Lap 47, with Harvick beside him and Edwards in 17th place, the last car on the lead lap thanks to the infraction. As Harvick battled Busch and Stenhouse for the top spot, Edwards began a methodical climb through the field, working his way to the sixth position within 15 laps. Harvick swapped the lead with Stenhouse three times, and Harvick on his team radio acknowledged the broader implications of that battle. Harvick owns the No. 2 Chevrolet driven by Elliott Sadler, and entering Saturday’s event, Sadler trailed Stenhouse by five points in the race for the Nationwide championship. Sadler finished 10th. He remains second in the standings but is now 13 points behind Stenhouse. That caution and one that followed on Lap 76 for Michael Annett’s spin through the infield grass bunched the field and gave Edwards the opportunity he needed to regain the lead. After trading the top spot with Busch following a restart on Lap 82, Edwards moved to the front decisively on Lap 102 and began to pull away. By Lap 110, he had a lead of 1.394 seconds over Busch.